Downtown St. Helena! Lovely, custom built in 1989 to embrace indoor/outdoor living, this Craftsman has a gorgeous & spacious front sitting porch with ceiling fans. Hardwood floors & crown mouldings grace the living areas & the master bedroom. The spacious kitchen has eat-in dining, Viking gas stove, double ovens & silestone counters. 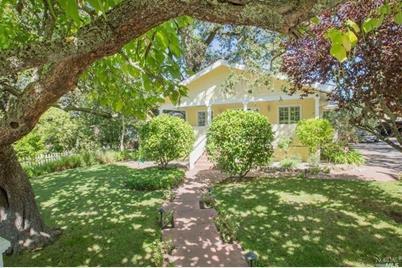 A home with a lovely-woodsy charm, yet open & light. Separate office and wine cellar in garage bonus area. Driving Directions: Main St. in St. Helena to Hunt Ave. Approx. 3 1/2 blocks from Main St to the east. 875 Hunt Avenue, Saint Helena, CA 94574 (MLS# 21418215) is a Single Family property that was sold at $1,250,000 on July 23, 2015. Want to learn more about 875 Hunt Avenue? Do you have questions about finding other Single Family real estate for sale in Saint Helena? You can browse all Saint Helena real estate or contact a Coldwell Banker agent to request more information.